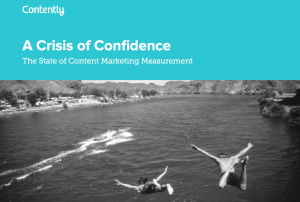 The MediaPost piece cites research from DMR and TripleLift, but more telling are these numbers from Contently’s new research report, A Crisis of Confidence: The State of Content Marketing Measurement . . . This entry was posted in Uncategorized and tagged A Crisis of Confidence: The State of Content Marketing Measurement, branded content, Contently, Digiday, DMR, MediaPost, native advertising, Sneak ADtack, TripleLift. Bookmark the permalink. Out of business? Sounds like work for both of us. I’ll give them quality bogus content. Yeah, that’s a crowded field, Mick. Sharpen those elbows.